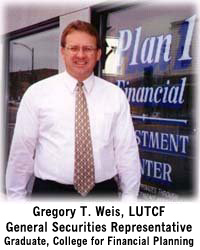 Log in to your Accounts Greg Weis and Marty Weis are the investment professionals at Plan 1 Financial. Based on what is right for you, they will suggest a single investment or a total plan from the complete range of investment options available. Come in and take advantage of our knowledge and experience. We will be happy to visit with you in complete confidence. Plan 1 Financial is located at 403 West Water Street in downtown Decorah, Iowa. Office hours are Mondays through Fridays, 8:30 a.m. to 5 p.m.; and evenings and Saturdays by appointment. Plan 1 offers a complete range of investment options, including stocks, bonds, mutual funds, annuities, individual retirement accounts, and much more. Full service and nationally-competitive discount stock trading is available. At Plan 1 Financial, Greg Weis and Marty Weis offer the knowledge and experience to assist you with your retirement goals. Call 563-382-8258 to schedule a free investment consultation today. Interested in exploring a new path for your investment future? Greg Weis and Marty Weis can help you work toward your financial goals. At Plan 1, you can work with people you know ... people who know you! Call 563-382-8258 to learn more. To be well balanced these days, a typical investor needs more ways to grow and protect themselves. To learn more about the Plan 1 Financial balanced approach for investing, see Greg Weis and Marty Weis at Plan 1 Financial in downtown Decorah. They are here to help guide you in planning and protecting your estate. Call 382-8258 or stop by the Plan 1 Investment Center at 403 West Water Street in downtown Decorah to learn more today. Do you have American Funds accounts in your investment portfolio? 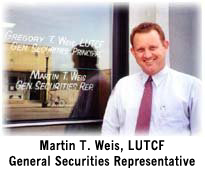 Gregory T. Weis and Martin T. Weis are Registered Representatives of and securities are offered through LaSalle St. Securities LLC (LSS), Member FINRA/SIPC. Plan 1 Financial & Heartland Investment Associates Inc are not affiliated with LSS. Securities in accounts carried by National Financial Services LLC ("NFS"), a Fidelity Investments company, are protected in accordance with the Securities Investor Protection Corporation ("SIPC") up to $500,000. The $500,000 total amount of SIPC protection is inclusive of up to $250,000 protection for claims for cash, and is subject to periodic adjustments for inflation in accordance with terms of the SIPC statute and approval by SIPC's Board of Directors. NFS also has arranged for coverage above these limits. Neither coverage protects against a decline in the market value of securities, nor does either coverage extend to certain securities that are considered ineligible for coverage. For more details on SIPC or to request an SIPC brochure, visit www.sipc.org or call 202.371.8300. The "excess of SIPC" coverage would only be used when SIPC coverage is exhausted. Like SIPC protection, "excess of SIPC" protection does not cover investment losses in customer accounts due to market fluctuation. It also does not cover other claims for losses incurred while broker-dealers remain in business. Total aggregate "excess of SIPC" coverage available through NFS's "excess of SIPC" policy is $1 billion. Within NFS's "excess of SIPC" coverage, there is no per customer dollar limit on coverage of securities, but there is a per customer limit of $1.9 million on coverage of cash. This is the maximum "excess of SIPC" protection currently available in the brokerage industry. 1 Fidelity's "excess of SIPC" insurance is provided by Lloyd's of London together with Axis Specialty Europe SE, Markel International Insurance Company, XL Specialty Insurance Company, and Munich Reinsurance Co.